To celebrate the release of SJA Turney’s latest book, Praetorian I am dedicating the blog to to all things Roman. Praetorian tells the story of a young and inexperienced legionary, Rufinus. During a battle in the Germanic wars he inadvertently saves the life of a senior officer. As a “reward he is promoted to the elite Praetorian guard, and thrust into the murky and dangerous world of the Imperial Family. As he tries to adjust to his new role he comes to the attention of the new Emperor Commodus and is drawn ever closer to the Imperial bosom and all the inherent dangers of being that close to power. SJA Turney is probably most well known as the author of the excellent Marius Mules series featuring the irasicable Fronto. Praetorian is the first book in a new series that will feature young Rufinus. I have been a fan of the author’s for a few years now and the Marius Mules series is one of my favourites and I glad to say this book maintains the standards I expect from the author. I enjoyed the fact that the book is a complete departure from the Fronto books, it can be very easy for an author when writing a new story in a familiar setting to blur the between the two stories. While Fronto books are heavy on battles and slaughter this book is much more concerned on the intrigue of the Imperial family though fans need’nt worry there is still plenty of bloodshed! The character’s are well rounded and Rufinus is a likeable man who is desperately trying to fit into his new surrounding. One of the most interesting characters is Commodus, we all remember the monster from Gladiator but in this book he much more of a three dimensional character rather than the one dimension monster. I actually really liked him and it will be interesting to see how the author deals with him as the burden of power bear down on him. This is a cracking book and I can highly recommend this and the author’s back catalogue. The author has kindly agreed to answer a few questions so please enjoy them below. 1) Can you give us a quick plot outline for Praetorian? 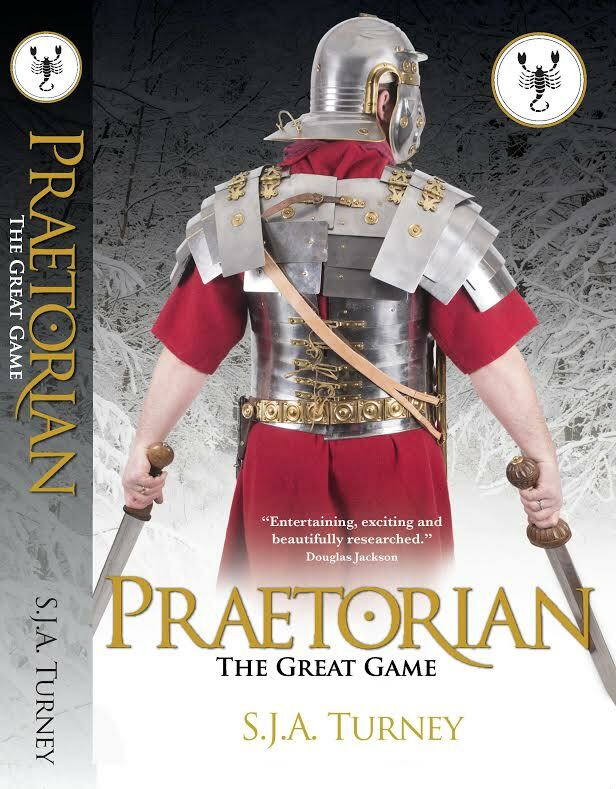 Now, without spoilers, obviously I can only go so far, but in very shortened form, Praetorian is the story of a young legionary during that horrendous war at the end of Marcus Aurelius’ reign who through sheer chance saves the life of a Praetorian prefect and finds himself suddenly and unexpectedly promoted to the Guard. When the old emperor dies and his son Commodus comes to the throne, peace is achieved and Rufinus is posted back to Rome where he has to overcome prejudice and bullying which again indirectly leads to him being given an undercover mission: to infiltrate the great imperial villa currently inhabited by the emperor’s sister, who the Praetorian prefect suspects of involvement in a plot to kill her brother. There follows a tense investigation to discover the details and then a race against time to save the emperor’s life. 2). Where did the idea for this book come from? Really it was born out of the desire to write about one of Rome’s more maligned emperors and to try and portray him in a more sympathetic light. In reviewing Commodus’ early reign, the plot against him that involved his sister leapt to my attention as it has been completely overlooked in both Hollywood treatments of that emperor and rarely written about. I had a plot and a villain. All I needed was a hero. I wanted someone completely different from Fronto, so Rufinus was partially born as an anti-Fronto. Young rather than old, inexperienced instead of a veteran, a nobody instead of a noble officer. The list goes on. Everything just fell into place so easily. 3) Being so well known for your Roman series Marius Mules was it daunting to venture into a different period of the Roman Empire? 4) What is it about the Roman period that attracts you to it? I think there are several things that make Rome such an attractive proposition. Mainly, it is the sheer scale of it. If you include everything, you’re looking at an empire that begins in 753BC with the founding of an aggressive city and ends in 1453AD with the fall of Constantinople to the Turk. That’s 2206 years of the same empire in various forms. By comparison, England has only been a unified country for less than half that time! In that time Rome was a kingdom, a republic, and two very different empires. It was pagan and then Christian. Stretching from Portugal to Arabia and Scotland to southern Algeria, it encompassed a vast, varied area. The sheer scope of the era is astounding. And yet many people still think of Rome and see that traditional view: a legionary in segmented armour, bearing a shield with lightning bolts on it, or a senator in a toga. The beauty of exploring the Roman world and writing about it is being able to try and shatter that image. Ben Kane often portrays the early Rome, where the army is formed in a different manner and the soldiers far more resemble the Greek army of Marathon or the Macedonian forces of Alexander than anything people commonly picture as Roman. Conversely, Gordon Doherty portrays late Rome, where the nobles look more Persian than Roman and togas are a thing of the past, and the legions have all-but gone to be replaced by mobile field armies of fast-moving light infantry and cavalry and by barbarians serving the empire on a retainer. It’s almost impossible to get one’s head around the scale of Rome. Some of the most intelligent scholars in the world have spent a lifetime studying Rome and still only unearthed a corner of it. And, let’s not forget that Rome is the first culture to be thoroughly recorded in written language throughout most of its time. Greek scholars will, of course, berate me for that comment, but I would suggest that there is far less written evidence for the bulk of ancient Greek culture than for Rome. 6) For a long time you were self published, would you recommend the self published route for budding writers? 7) What is a ‘typical’ writing day for you. Actually, I rarely ever get started on time. I plan to start by nine, but the kids always edge that up a bit. I tend to admin first thing (correspondence, site updates etc.) Then I lock myself away in the office, crank up the music, switch on the coffee machine, check my plan for the day, work things through in note format and then write solidly, on occasion taking the time to pop downstairs for a bite of lunch. I write until 5, trying to fit in some editing in the meantime. In essence, I write at speed for 8 hours a day, fueled by coffee. In retrospect, actually, I’ll say 7 hours. Internet research and twitter are wonderful distractions, after all. Fascinating to set out with Google to learn the Latin name for a river in central France and end up learning the history of the Muppet Show. Gods bless the Internet! 8) What authors/writers inspired you to take up writing. Very simply: Guy Gavriel Kay. I have many authors I love to read, but the one who inspired me to try and create my own tale is Kay. Indeed, passing Marius’ Mules by, my other early work, Interregnum, was very much my attempt to emulate that man’s works. I have had it compared once or twice by readers, and that, for me, is the greatest compliment I can imagine. Plenty! That’s the simple answer. The final installment of the Ottoman Cycle is now just awaiting a cover before it’s ready to publish. A book that I have written in collaboration with Gordon Doherty is now complete and about to be sent off to our agents to see what might become of it. Another collaboration (a Roman-based childrens’ book with illustrations by the talented Dave Slaney) is also with my agent, seeking placement. All these things are on the cusp, as well as a collection of Roman short stories for charity. And I am about to write Marius’ Mules VIII: Sons of Taranis. And late in the year it will be the turn of Praetorian II, which is already fully planned out and ready. It’s all go in Turneyland. This entry was posted in Roman Fiction. Bookmark the permalink. This is a great interview. Love your comments on the wonder and vastness of Rome. There’s still lots to write about, thank god or gods – or humans. Good luck with the new book.